the Eagles capitalized on a turnover in the ‘Blades end and snuck a pass low at the crease to Olsen who steered the puck off the inside of Ouellette’s pad and into the net for the game-winner to seal a 5-4 Game 3 victory for the Eagles. He is not even in AHL?! It's disturbing that guys we have started in the NHL and even played on the 3rd line can't even hold down an AHL spot. 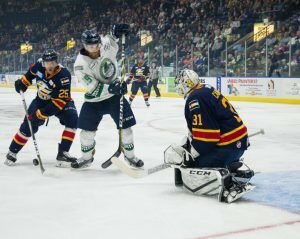 ESTERO, FL – Gus Young’s goal at 8:28 into overtime guided the Florida Everblades to a dramatic 7-6 victory over the Colorado Eagles in Game 4 of the Kelly Cup Finals played Friday night at Germain Arena. The best-of-seven series is now tied at 2-2. Absolutely, but also encouraging to see how far we've come from there, no? I look at our forwards prospect pool and don't know what we're going to do with them all. Won't be room on the Canes if as many of them develop as I hope. At least not if we're smart with acquiring/ retaining the veteran forwards we need to be competitive in the near term . 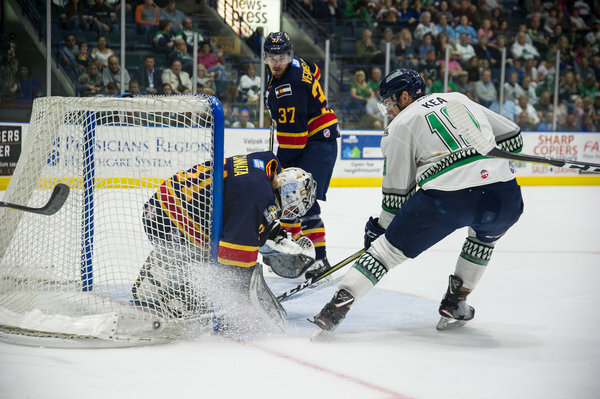 . .
ESTERO, FL – Martin Ouellette stopped all 24 shots faced to pace the Florida Everblades to a 5-0 victory over the Colorado Eagles in Game 5 of the Kelly Cup Finals played at Germain Arena Saturday night. Florida now leads the best-of-seven series 3-2. Colorado won 4:2 and have series tied, forcing Game 7. Do Everblades have "Mr. Game 7"? OBXer, if you would have more info available to post, please do - always appreciated. In terms of 5-on-5 play, the third period featured the best scoring opportunities for the Everblades. The chances were there, but the ‘Blades couldn’t find any puck luck. Brett Bulmer came close to bringing Florida within one goal with 2:25 to play, when he shot a rebound that squirted out to him from of the crease. However, Cannata pounced on it as Bulmer had just gotten his stick on it. A Good Run Comes to an end. Great Season for the Everblades. ESTERO, FL – Gabriel Verpaelst scored with 2:29 remaining in regulation to lift the Colorado Eagles to a 3-2 victory over the Florida Everblades in Game 7 of the Kelly Cup Finals at Germain Arena Saturday night. The Eagles win the Kelly Cup for the second consecutive season. Florida pulled Ouellette with a little over a minute to play for the extra attacker to try and get back in the game. However, the ‘Blades were unable to get the tying goal to force overtime and their season came to an end as the Eagles secured the 3-2 win and repeat as Kelly Cup Champions.